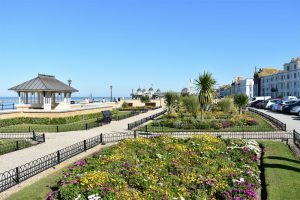 My area guide to living in the seaside town of Herne Bay on the Kent coast by local resident Haydon Rouse. Fossil of the world's earliest known horse, dating back 54 million years, was discovered in 1838 in the cliffs at Studd Hill, Herne Bay. Herne Bay's seafront is home to what's thought to be the world's first freestanding purpose-built Clock Tower, built in 1837. The first substantial houses in Herne Bay town were built about 1820. The actor and presenter Bob Holness lived in the town as a child and attended Herne Bay Primary School. In the early 18th century windmills in the Herne area — there's one remaining on the hill, were used by smugglers for signalling purposes. Herne Bay has a wide array of property types including bungalows, terraced houses, flats, apartments, detached and semi detached houses. There is a varied mix of Georgian, Regency, Victorian/Edwardian, Art Deco and modern style properties. For smaller families or young professional couples who are looking for smaller residential properties, many of the large, terraced townhouses have been converted into flats. There have also been many new build properties alongside the Thanet Way that attract many professionals, especially those working in London and who enjoy the lifestyle that owning such a property brings. One of the oldest properties in Herne Bay is the Grade II Listed, Underdown House (pictured right) in Eddington which has a 17th-century west wing and an 18th-century frontage. Nearby is 'The Old House', which is possibly the 'Old Coach House' - a listed late 17th to early 18th century building, described by English Heritage as weatherboarded with a tie-beam roof. When it comes to finding a property in Herne Bay, there is something to suit everyone. Studd Hill is on the far west of Herne Bay. Originally built as a holiday home resort for Londoners. It is a quiet private estate with unadopted roads. The original properties were very small chalet bungalows and of single-skin construction, mainly asbestos sheeting. Now a lot of the properties have either been completely rebuilt or extended and updated with modern materials. With the sea being so close, there is still that holiday feeling to the area. On the west side of town, Hampton tends to be quite a quiet area. Properties in this area are a wide mix of styles, with some quite large detached houses. The shops, Post Office and Co-op along Sea Street are within easy walking distance. The roads near the sea front can get very busy during the summer months, as holiday makers park nearby for easy access to the beach. The properties along Western Esplanade have some fantastic panoramic sea views. South of the old Thanet Way. Properties near the old Thanet Way may get some road noise, but if you have good double glazing should be fine. Near to Briary Primary School. Few shops. On bus route. Outlying suburb. The old Thanet Way separates Greenhill from Herne Bay. Has a few shops - chippie and newsagent by the roundabout. Close to Herne Bay High School and Briary Primary School. The Bay Sports Arena is in Greenhill along Bullockstone Road. Greenhill has its own Gymnastics Club and a wide range of community groups and organisations. On the south east area of Greenhill there is a lot of decent sized council and ex-council houses with good sized gardens. Also quite a large number of bungalows in the Greenhill area. 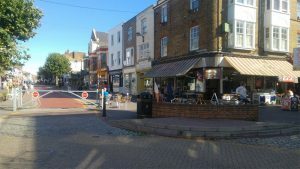 In Herne Bay town itself you are obviously close to all the shops and amenities, however it is going to be nosier. Also bear in mind that parking in some areas is restricted, but of course you can buy residents' permits from the council. Terrace housing and flats above retail spaces makes up the majority of the residential properties. The Old Town area is to North East. It is where some of the towns oldest building are, including the Ship Inn on the seafront. The further you from the High Street the quieter it general is. 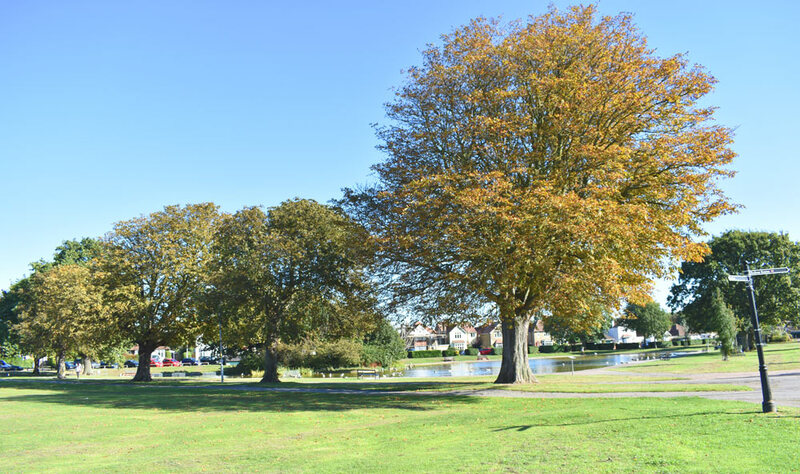 Just to the south of the main town and high street is Herne Bay Memorial Park, a well established park with mature trees on ‘chines’ (paved footpaths). Bounded on north by varying developments on King’s Road, including Herne Bay Junior School. The modern flats here are made prominent by being three storey plus. Spenser Road and Station Road roads are lined both sides with detached and semi-detached dwellings; the key elements are the relatively low density and the mature street trees. Eddington has some of the oldest properties in Herne Bay (Underdown House and The Old House). It used to be it's own village (first mentioned in 1466!) until becoming a suburb of Herne Bay. Now it has a wide mix of properties. Quite a quiet area. To the South East, on the other side of the old Thanet Way, is the new Redrow Homes development called The Fairways. Situated on the former golf course, it enjoys an open aspect, while remaining conveniently close to the main routes. Lower Herne is part of Herne village which is on the outskirts of Herne Bay. Lower Herne is quite small and away from the main road it is quiet and peaceful. Lots of bungalows in this area. The hamlet of Bullockstone is about one mile to the west... lots of farmers fields and open space. Herne is a village on the outskirts of Herne Bay. It is actually an ancient village and is how Herne Bay got its name. There is a very pretty church in the heart of the village, as well as a pub called The Smugglers. Herne C. of E. Junior School is in Herne. Away from the traffic negotiating the small roundabout in the centre of the village, Herne is generally quiet and peaceful. A wide mix of housing, with a lot of bungalows. Up on the hill is Herne Windmill, which was built in 1789. Mostly residential although there are a few local shops including a takeaway. Relatively quiet and there are some new development areas. Various different properties, some ex-council, starter homes, terraced, large detached and everything in-between. Broomfield has a local doctors surgery and pharmacy. It has in certain areas, lovely country views over the fields. A more expensive part of Herne Bay, Beltinge has some lovely cliff top walks. A lot of bungalows higher up on the West side, but there are also large detached and semi detached houses. A very quiet area. Reculver Church of England Primary School is adjacent to the church at Hillborough. To the far East of Herne Bay is Reculver. Home to the Reculver Towers and Fort and famous landmark. There aren't that many properties in Reculver. It is dominated by static caravan parks. There is a country park (a nature reserve), the King Ethelbert public house and a nearby shop and cafe. Rail - Herne Bay has a train station with direct trains to London terminals, Medway Towns, North Kent, Dover, Ashford and the Thanet loop. A high speed rail link to London St. Pancras takes about an hour and 25 minutes. Direct line to London Victoria (approx. 80 minutes journey time). 92 car parking spaces. Buses & Coaches - Stagecoach in East Kent operates a regular service from Herne Bay to Whitstable and Canterbury, known as "the triangle". Takes about 35 mins to Canterbury. National Express Coaches also offers a service for longer coach journeys in and out of the town. Car/Road - there is easy access to road links including the Thanet Way to Margate and the M2 motorway providing easy links to/from London. Herne Bay is a short drive from Canterbury, via the A28/A281 and A290. There is never a shortage of things to do in Herne Bay, because of the amazing variety of eating establishments, pubs, events, historic places and clubs. There is a cinema, galleries, a swimming pool, gyms, and parks. The list goes on! 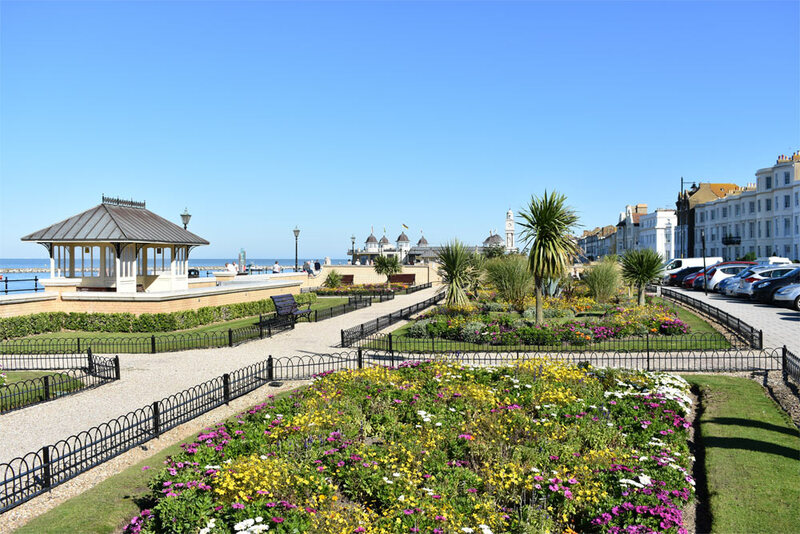 Herne Bay boasts a number of parks and green spaces in which you can just relax and enjoy the views or partake in some physical activity. 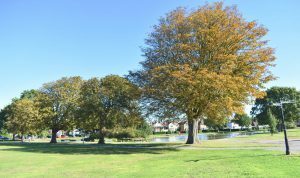 Herne Bay Memorial Park is situated in the heart of the town and offers a wide range of outdoor activities for the whole community. It has formal planted gardens, mature trees, a boating lake, a play area and several sporting facilities. Long Rock is a coastal open space between Herne Bay and Whitstable. If you're looking for a little more physical activity, two cycling routes (the Viking Coastal trail and the Oyster Bay trail) pass through the Long Rock area. Waltrop Gardens on the seafront is a quaisi Victorian sunken garden with seating. Cherry Orchard Recreation Ground in Herne. Kings Hall on the seafront, also sometimes has theatrical performances. Central Bandstand - A historic landmark on the Herne Bay seafront. There is an stage where live music is performed and a seating area. A real sun trap. Inside area has a cafe and an Indian restaurant. Beach - Herne Bay beach is shingle and pebbles and has a number of groynes stretching out into the sea. Has a promenade for lovely walks along the front. Herne Bay east beach is backed by a sea wall and behind that, grassy slopes, known as The Downs are criss-crossed with a number of footpaths. This area is a haven for birdlife and has been designated a Special Protection Area for birds. Pier - another historic landmark, once one of the longest in the country, now much shorter after storms destroyed a large section. It has a helter-skelter, carousel, ice cream parlour, fish and chips and a selection of beach huts from which people sell various gifts and foods. Free fishing and crabbing attracts young and old. Musical entertainment and other events are regularly held on the pier. Herne Windmill - a Grade I listed smock mill, open from Easter to end of September. Kavanagh Cinema - an independent cinema with 2 screens showing latest mainstream releases and classic films. Reculver Towers and Fort - Medieval ruins. Site of one of the earliest Roman forts built against Saxon raids on the 'Saxon Shore'. It later became the site of an Anglo-Saxon monastery. The Kings Hall - a theatre, concert hall and dance hall. It was built as The Pavilion in 1903–1904. Clock Tower - a Grade II listed landmark. Believed to be one of the earliest purpose-built, free-standing clock towers. Thornden Woods - Ancient woodland and a site of special scientific interest. Herons Leisure Centre - has a gym, swimming pool and cafe. Wildwood Discovery Park - a woodland discovery park featuring over fifty species of native British animals such as deer, badgers, wild boar, wolves and brown bear. Herne Bay Mini Golf - 18 hole mini golf course suitable for all ages / abilities. Open all year round. Very Vintage, 25 William St.
Salt and light, 159 Mortimer St.
Cafe Latino, 95 Mortimer St.
Add your cafe/coffee shop to this guide to Herne Bay. Herne Bay town itself is ideal for window shopping with wide pedestrianised streets lined with a variety of shops. Alongside the big names on the High Street, you’ll also find various independent shops and stores. There are antique shops, gift shops, card shops, toy shop, pet shop, mens clothing shops, furniture shops, a Peacocks clothing shop, an Iceland, a Carphone Warehouse, hairdressers, charity shops, coffee shops plus much more. There is a market every Saturday from 8am to 4pm. and the next nearest is The Community College Whitstable and Archbishops C. of E. in Canterbury. School Ofsted Ratings, Catchment Areas etc. - View my Herne Bay schools information page. In the 2001 census Herne Bay had a population of 38,563 and a population density of 11.3 persons per hectare. Are you thinking of moving to the town? Herne Bay is a great place to live. 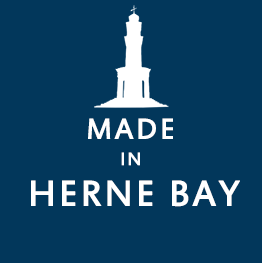 The town of Herne Bay took its name from the neighbouring village of Herne. Until the end of the 18th Century, Herne Bay was no more than a scattering of cottages and inns, inhabited by fisherman, smugglers and a few agricultural labourers. One of the oldest buildings in Herne Bay is the late 18th-century inn The Ship, which served as the focal point for the small shipping and farming community that first inhabited the town. There was little development until the 1830s, when a group of London investors recognised Herne Bay's potential as a seaside resort and built a wooden pier and a promenade on the town's seafront. The pier, built in 1832, was the catalyst to Herne Bay's rapid growth and success. Passenger steamers dropped day trippers off on the pier head and Herne Bay became a popular Victorian seaside destination. Local landowners then set about developing the area and building housing. Read about the history of Herne Bay Pier. The Herne Bay community holds a number of local events, some of which have become annual occurrences. Herne Bay Festival - "Bay Fest"
If you are looking for a Herne Bay estate agent to buy, sell, rent, or lease a property in Herne Bay or its surrounding area, then there is only one place to go! Contact myself, your local property expert working with 99home.co.uk. I'm professional and experienced with extensive knowledge of Herne Bay and the surrounding areas and provide a bespoke property service to help you sell, let and find your ideal property. Call me, Haydon, on 07949 430339. I have created this guide as just that, a guide! You should do your own independent research before taking any action. These are my own personal findings and you may feel differently - this is a guide only. I hope you have enjoyed this Herne Bay area guide and found it useful. If you have any feedback or suggestions then please let me know! If you run a business in Herne Bay you may be interested in my Herne Bay Advertising Manual.